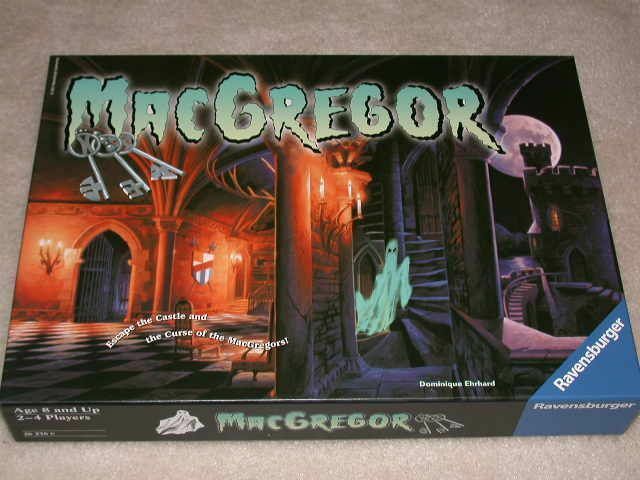 It's midnight and the dreaded Ghost of MacGregor is haunting the castle. No one knows which way he'll choose to go as he chases the other players through the halls of the castle. Decide on your best chance for escape, but be careful because all of the doors are locked so you'll definitely need the right keys. The players are trying to be the first to escape the castle before being caught by the ghost. The player controlling the ghost must capture/tag another player if he wants to win. The ghost is moved via 5 preplanned moves each round, similar to Roborally and Dragon Delta and can move through walls. The other players must collect the right key cards to move through the colored doors, but may only hold four key cards. If the ghost captures another player, they switch roles with the captured player becoming the ghost and moving to the dungeon to start the next round. The former ghost takes the key cards from the new ghost and tries to escape the castle. Most important: The player figures glow in the dark!